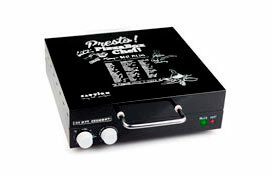 The Presto™ Pizzini Forno Chef lets you cook up to 5 mini pizzas at the same time. Just place the dough in the center of the spatulas, bake it for some minutes, add your favourite ingredients and start rubbing your hands! 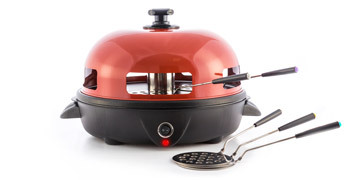 The ceramic coated electric pan that will revolutionize your kitchen! This smart electric oven will cook your most delicious recipes to perfection in minutes. The oven includes a rotating pan that cooks your pizza while the grill mechanism on the top melts your favourite ingredients evenly for a pizza that you’ll never forget. We bought this for our camper and are very happy that it is lightweight. 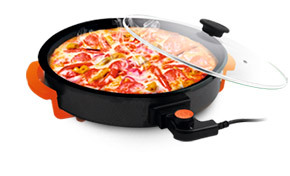 It cooks frozen pizzas perfectly without having to heat up your whole oven. Excellent product. This pizza maker is fast and energy efficient for baking 12 inches pizzas. Non-stick coating makes cleanup easier and bakes your crust to perfection. I would recommend this to all the home made pizza lovers out there! It works really well. I have used it to cook both a frozen and a home made pizza; both turned out really good. The crust turned out crisper than on a traditional oven for both.